All transactions are safe and secure with a reliable history in online purchasing behind each of our associates. 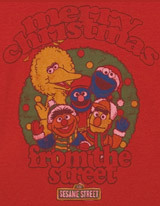 Buy the Merry Christmas from the Street t-shirt to own Sesame Street clothing and merchandise. Merry Christmas from the street...Sesame that is. Your favorite Sesame Street characters have dressed up for the holidays complete with Santa hats to wish you a merry Christmas. This Sesame Street tee is bound to have you reminiscing about your own holiday memories. Spread the message with these Big Bird tees to remind everyone what the season is all about. Pair it with an Oscar the Grouch t-shirt for the perfect jolly / not so jolly combo. Add toys, Snuffleupagus plush stuffed animals and Sesame Street hats to complete your gift. In addition to the Merry Christmas from the Street tee above, browse the Sesame Street Clothing Gallery for more apparel like men's and women's clothes, kids shirts or hoodies.